Here are 4 free Windows 8 pregnancy apps that guide you throughout your pregnancy.. right from the day you learn you are expecting to the birth of you child. Having these pregnancy Windows 8 apps will help you to have fit and healthy delivery. Mayo Clinic on Pregnancy is a free Windows 8 pregnancy app that guides you during the development of your fetal and the birth of your child. It provides you tips and valuable info to guide throughout your pregnancy.. Starting from the day you learn you are expecting all the way to the birth of the child including the postpartum know-how. All these things actually help you to become more confident about your delivery and earliest months of baby’s arrival. The experts of Mayo Clinic on Pregnancy provide you all the possible info that you need to know during your pregnancy so that you can safe and healthy during your conception period. You can learn how the changes take place throughout your pregnancy, tips to ease out pregnancy symptoms, safe medications during pregnancy, benefits of prenatal vitamins, stay fit and healthy during pregnancy, get answers to all your queries regarding dos and don’ts during pregnancy, what to eat and what not to, breastfeeding tips, learn how much your baby needs, learn about diaper rashes, and much more. As you open the app, the welcome screen will ask you to choose one between ‘Are your expecting?’ and ‘Have you had your baby?’. Although, you can change the settings later on by heading over to ‘Settings’ of the app. It’s extremely simple to access Windows 8 pregnancy app. Go ahead and download Mayo Clinic on Pregnancy. 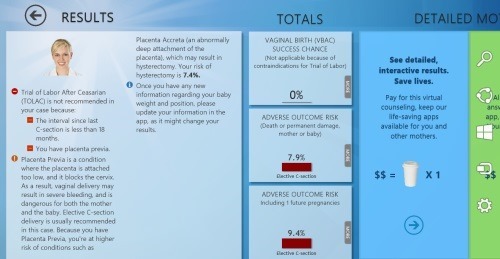 Pregnancy: Repeat C-section or VBAC is another pregnancy Windows 8 app that is a must-have app for those who previously had C-sections and now are pregnant or planning to become. You can learn if it is safe for you to attempt Vaginal delivery after one or two Cesarean ones. The result tells you which mode of delivery is the safest for you: Cesarean or Vaginal. This pregnancy app makes use of statistical data from different scientific studies based of trillions of deliveries, which can help you with this probably life-changing decision. The predictions are developed by Dr. Albert MD along with his team. This Windows 8 pregnancy app first asks you to fill in the details such as your age, Are you currently pregnant?, How many weeks pregnant?, singleton or twins, and more. Once you are done with your basic details then you need to fill in details such as your delivery date, delivery mode, C-section reason, incision type, etc. It will quickly show up the result and give you the info in detail. However, to get the complete details, you need to pay a small amount. Nonetheless, the app is worth paying off. So, go ahead and download Pregnancy: Repeat C-section or VBAC app in Windows 8 now. Parents Pregnancy & Baby Guide brings you week-by-week pregnancy guide for to be parents and for very new parents… right from the day you learn you are pregnant, to the development of fetal, to postpartum period, to the end of baby’s first year – along with the guide to the second year of your baby. As you open the app, you will first require to select your due date and just move on. It will not show every week’s info including tip of the week, and other possible info that can help you in fit and healthy development of your child and as a result you can have healthy delivery. You can also add you photos each week and can see the slow change that you body, and skin are meeting, throughout your conception period. You can also get answers to all your queries such as How big is my baby?, changing body, learn how to breastfeed, relieve teeth pain, and other important tips. Go ahead and download Parents Pregnancy & Baby Guide app in Windows 8 now. Also,check out our posts on BMI Calculator Apps, Calorie Tracker Apps, and Photo Makeup Apps. Ending my post with Pregnancy Do’s and Do not’s app which is a very simple one and provides you the suggestions that you should follow during your pregnancy. There is a list of things covers things to be done during pregnancy and things that must be avoided throughout your conception period. As you open the app, you will find two different sections: Do’s and Do Not’s. You just need to click on one to read. 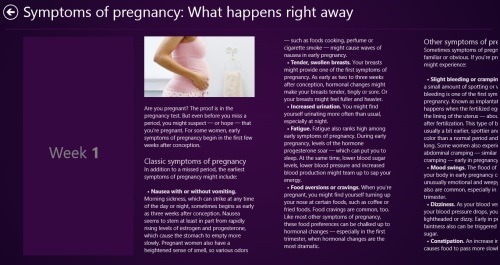 This Windows 8 pregnancy app is extremely useful for pregnant ladies and to be parents. 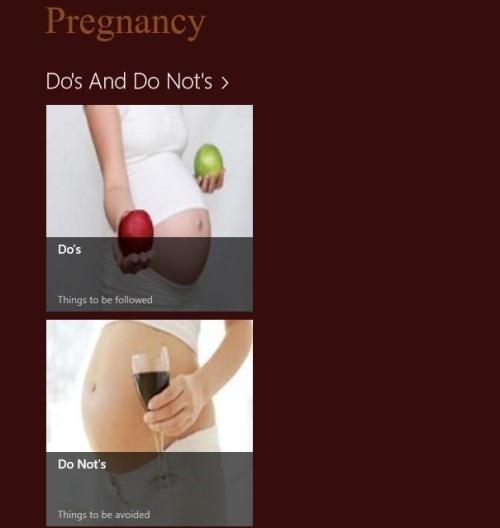 Go ahead and download Pregnancy Do’s and Do not’s app in Windows 8.